Sometimes even classics need an update. A shake up. A little paint on the porch if you will. 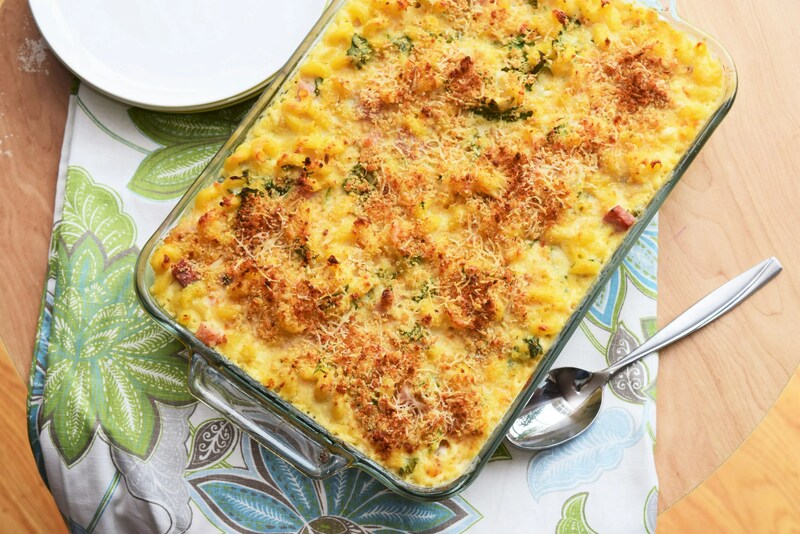 This dish has all the creamy goodness of the classic mac and cheese with a little shake up in the flavor department curtsy of the creamy, cheesy cauliflower sauce. Add in a little ham and kale and well, you’ve got a full meal deal! 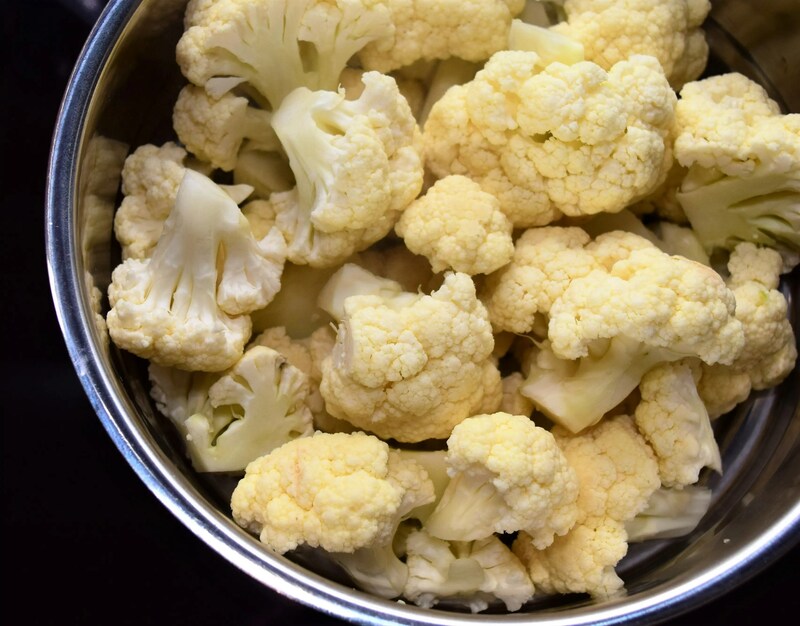 Start by steaming a little cauliflower until it’s nice and soft. 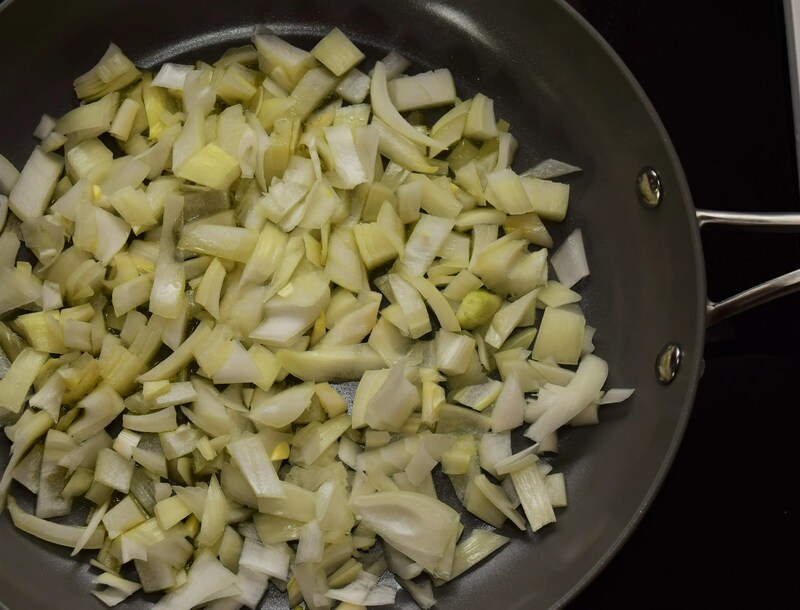 Meanwhile saute some onions in olive oil until they are soft but not brown. Here’s a tip. 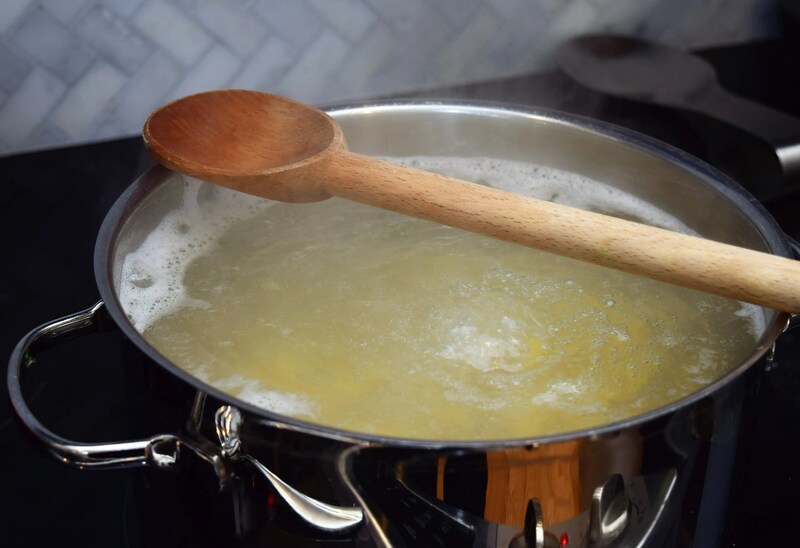 When boiling the pasta (or anything else) put a wooden spoon over the top and it will help break the bubbles of the boiling water and give you a little more time to turn the heat down before it boils over. And I can testify that it works great! Don’t forget to save a half cup of the pasta water before you drain the pasta. When the cauliflower is soft put it in the blender with the onions, milk and reserved pasta water. Blend until smooth. 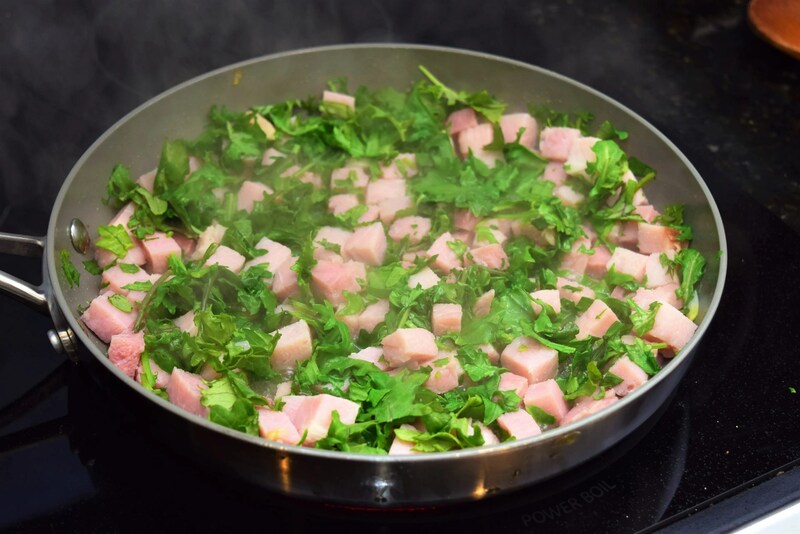 Saute the ham and kale, in the same pan that you cooked the onions in, until the kale wilts. I like using kale, but I will also use spinach or swiss chard if that’s what I have. In this case I used baby kale, that I bought to make smoothies. Baby kale is a bit easier as you don’t have to remove the tough ribs before chopping that you have to with the “adult” or more mature kale. Now it’s time to put the whole works together! Put the pureed cauliflower in the pot you cooked the pasta in and add in the cheese. 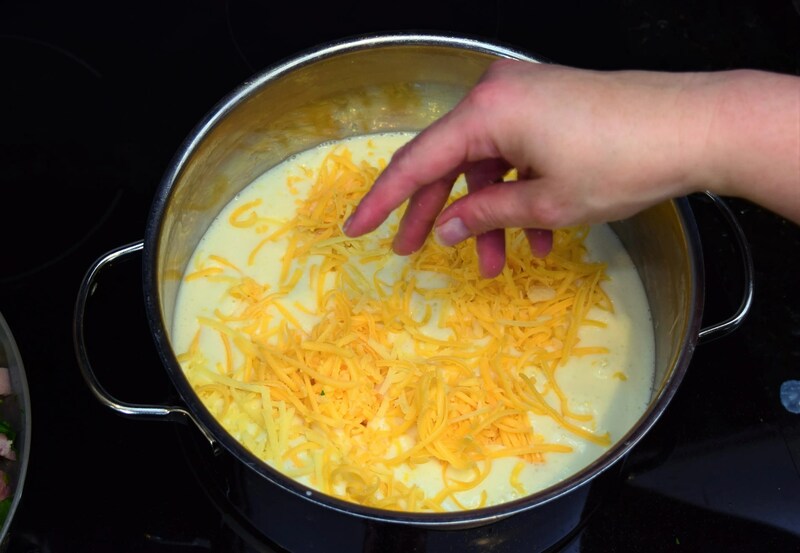 Stir over low heat until you don’t have clumps of cheese, but the cheese doesn’t have to be completely melted. I want to take a moment and introduce you to my new friend Sriracha! We’ve become close and he is now a staple in my kitchen. I know that some of you are crinkling your noses and saying that you don’t like spicy or hot food. (Hi Mom!) But I have found that sriracha used in small quantities just adds another layer of flavor to a recipe. Much like pepper adds flavor without making food too hot (unless you use a ton). 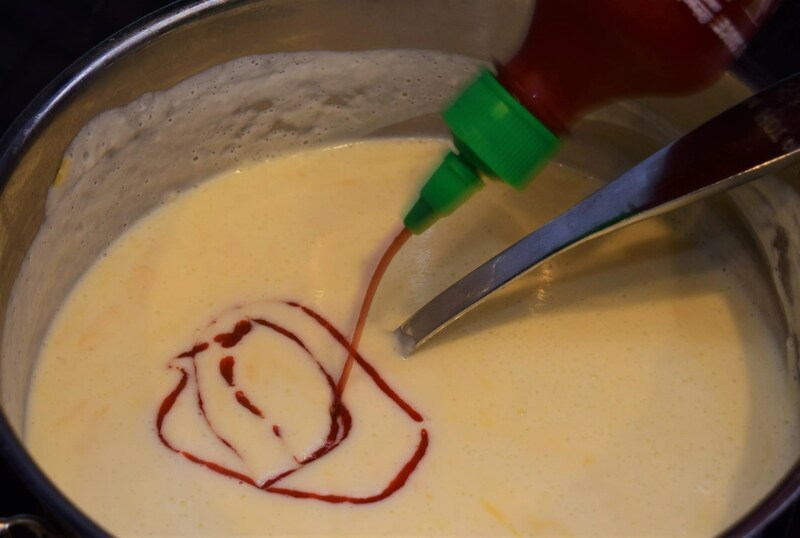 If you like things spicy use a whole lot more sriracha! Either way, taste your sauce then add some seasoning (aka salt, pepper and if you’re fancy sriracha). Then add a smidgen more. We are on the home stretch now. Add the pasta and the ham and kale into the cheesy cauliflower mixture and stir gently. Here’s another tip. Gosh I am full of tips today, aren’t I? 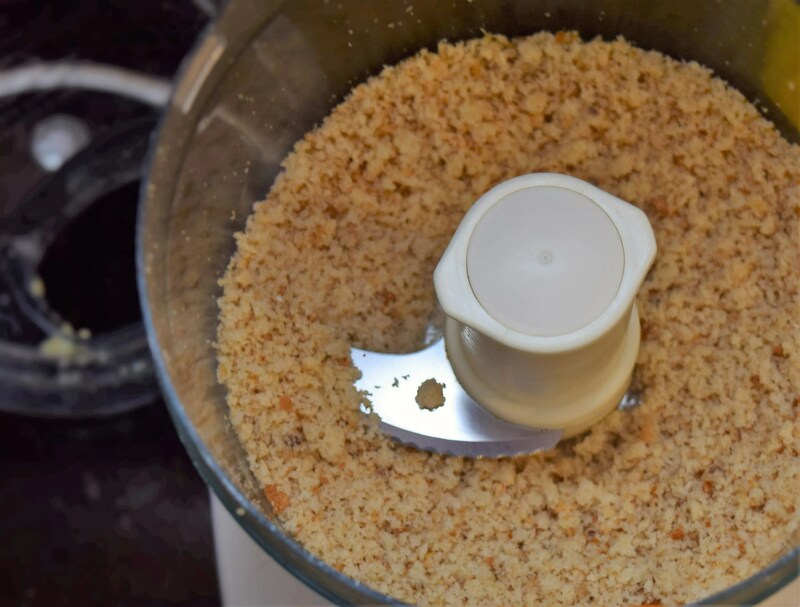 I usually just use fresh bread right out of the wrapper to make bread crumbs. 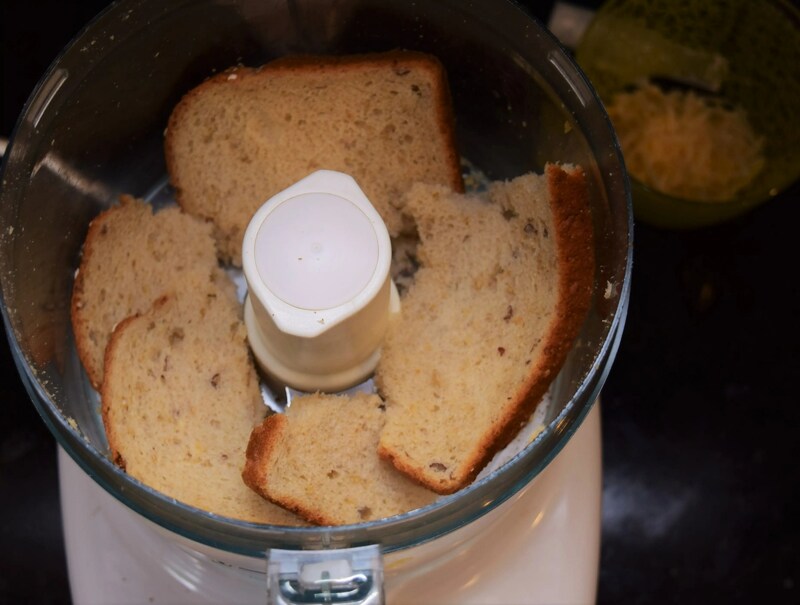 Just throw it in the food processor,or blender and hit pulse a couple of times…. And voila! You’ve got fresh bread crumbs. If you have eagle eyes, you might see some remnants of cheese in that food processor. I had just used it to grate the cheese. No use washing it for bread crumbs that I am going to add cheese to! 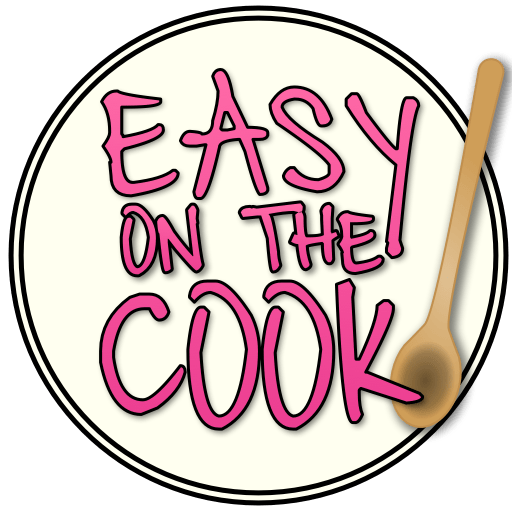 I like being easy-on-the-dishwashing too! Now just put the sauce, pasta and cheese mixture into a buttered 3 quart casserole and top with bread crumbs and Parmesan cheese! Then bake that puppy in the oven at 375 for about 30 minutes or until bubbly and browned! A twist on traditional mac and cheese, this recipe is made with a creamy cauliflower sauce. Ham and Kale make it a full meal deal! Steam the cauliflower until soft. It should take about 15 minutes. In a saute pan, heat oil then add roughly chopped onion until soft and translucent but not brown about 5 minutes. Meanwhile cook pasta in salted water according to the directions on the package. You want to make sure it is al dente so it doesn't get too soft when the casserole is baked. I usually boil the pasta about a minute less than is says to on the box. Just before you drain the pasta, set aside 1/2 cup of the cooking water. 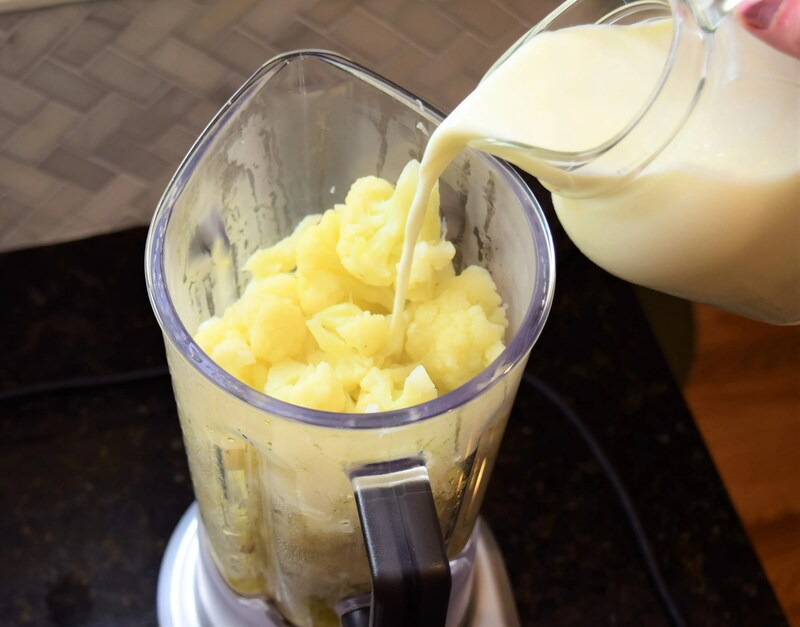 Put the cooked cauliflower and sauted onion in a blender with the cold milk and the pasta water. Blend until creamy and smooth. In the same pan that you cooked the onion in, warm the ham and add the kale. Saute on medium heat until kale has slightly wilted, about 2 minutes. 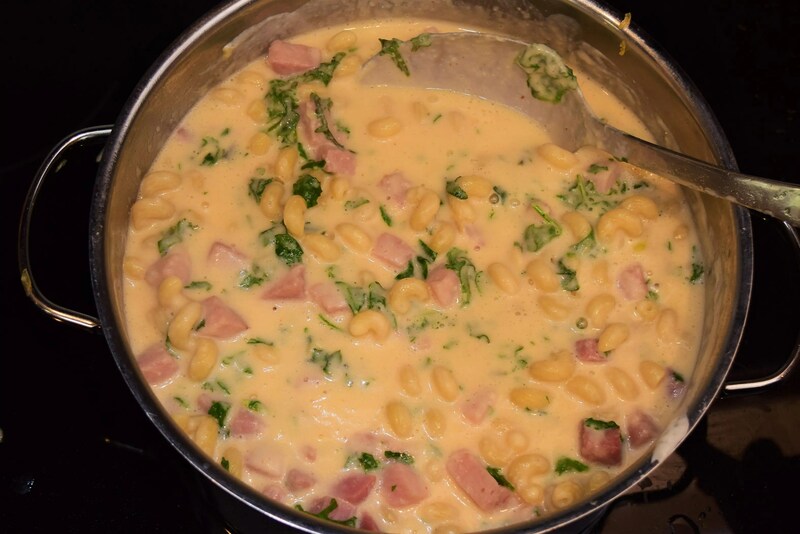 In the large pot you used for the pasta, on low heat, combine the creamy cauliflower mixture and cheese. Stir until you don't have clumps of cheese but the cheese doesn't have to be completely melted. Add salt and pepper to taste and sriracha sauce (if using). Add in pasta as well as the ham and kale and gently stir until well mixed. Transfer pasta mixture to a buttered (or sprayed) 3 quart casserole dish. Top with fresh breadcrumbs and Parmesan cheese. Bake at 375 for about 30 minutes or until pasta is bubbly and the top is well browned. Looks amazing. I’m going to call it a “healthy” version since it has kale and cauliflower! LOL! 2 veggies, it’s gotta be healthy right!? It certainly is delicious, the whole family likes it! Looks delicious! And pretty easy to make it gluten-free by changing the pasta. I thought the same thing myself! 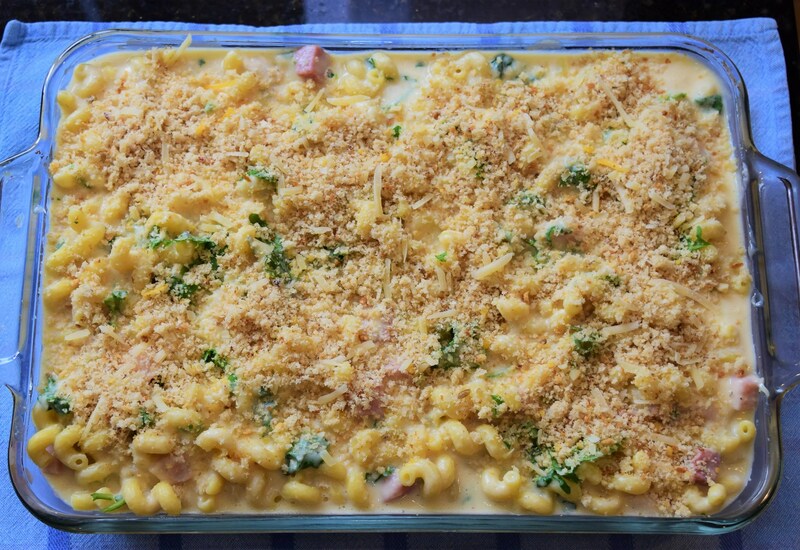 I really like the Trader Joe’s rice pasta and it would be perfect in this recipe!